Recently, Aldo Bumci of the Ministry of Tourism, Culture, Youth and Sports was on hand at the archaeological site of Butrint together with U.S. Ambassador Arvizu to open a new electronic ticket office. 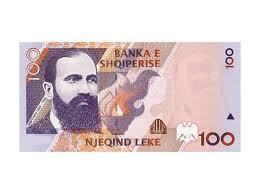 His observation came one year after Albania’s declaration of independence and a month after a the International Committee of Control was established by the Six Great Powers to organize the finances and administration of the country for a 10 year period. 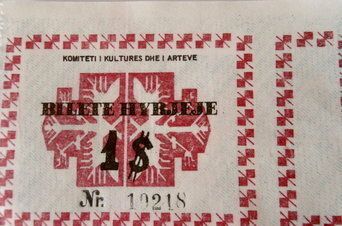 This article will summarize five cases regarding tickets in Albania’s cultural sector during the year of 2012. Butrint’s electronic tickets aside, has much really changed since Konica’s visit in 1913? 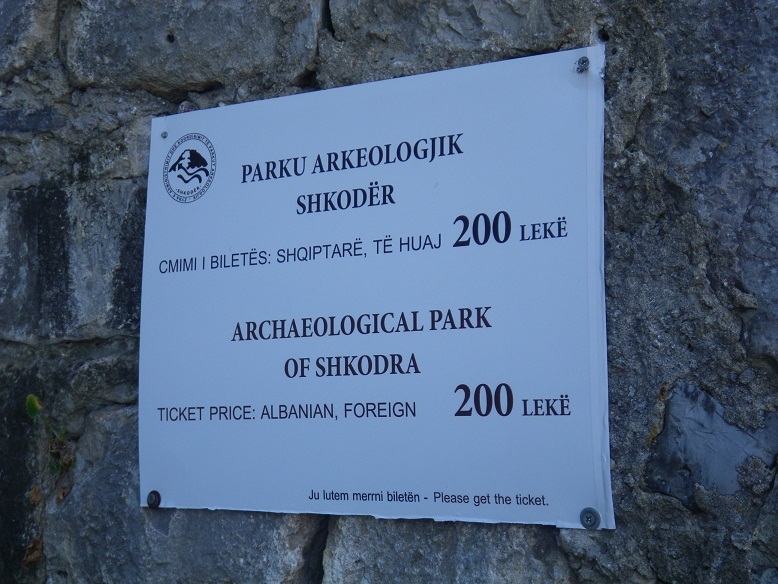 In June of 2012, Auron Tare reported that the National Archaeological Museum in Tirana still gives out tickets issued by the “Committee on Culture and Arts”, which is not authorized by the Ministry of Education to which the Museum of Archaeology belongs. Further, Artan Lame states that the “Committee on Culture and Arts” was an institution working for the Ministry of Culture in the 60-70s movie industry, and has not been active since the era of the People’s Socialist Republic of Albania. How can the Ministries of Finance, Culture (TYS), and Education allow this? Ilir Zaloshnja, who has worked for 40 years in museums attributes this to the low number of visitors, and they have not yet used all the tickets printed before 1990, and it highlights the “lack of funds” to print new tickets. Does that mean that the “Committee on Culture and Arts” or (any registered business for that matter), had a larger budget than is available to the Archaeological Museum in 2012, the 100th Anniversary of Independence, and with tourism numbers at a reported record high? Where do these tickets get registered, and does each ticket count as one visit, or is there a magic fairy sitting behind a desk calculating the formula: 1 visit to Rozafa (R) = two numbered tickets for Shkodra Archaeological Park (T) – a side deal (SD) / number of ‘discounts’ (D) = or the equation R = 2T-SD/D…? 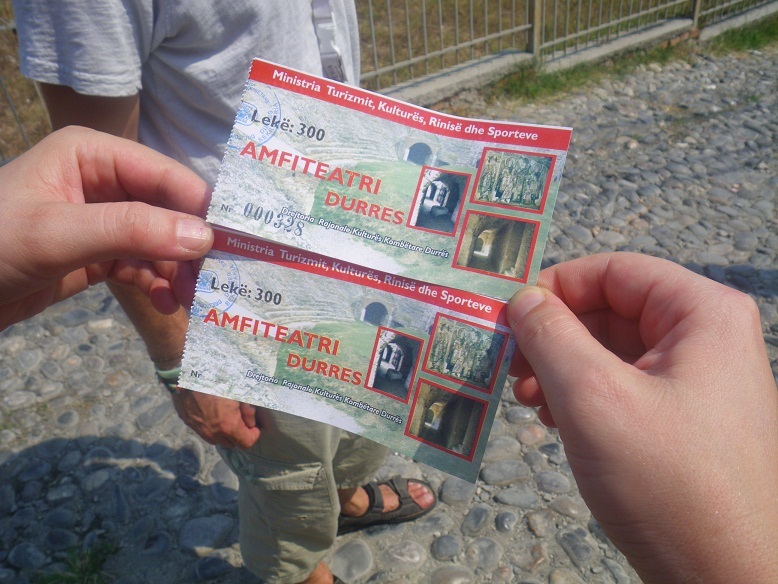 Durres Amphitheatre – 1 un-numbered ticket = 300 lek unaccounted for. In Minister Bumci’s annual analysis he states that the number of visitors to archaeological parks in 2011 was, (sounding very precise) 372,926. How many more visits may have been unrecorded, and of the registered visits, how many were issued ‘illegal’ tickets? Does the Ministry of Culture really have a magic fairy making these calculations? This we cannot know, however, with the Minister’s precise statement, we can deduce that the total revenue of 372,926 visitors x 200 lek admission is more than 74,585,200 lek of reported income for the 9 archaeological park visits. That’s over 31,000 times more than an Albanian’s yearly minimum wage salary, and equals about 8,287,245 lek per park in ticket revenue alone – and that’s off 200 lek admission. Pensioners with proof of official status; Veterans with proof of official status; Ex-convicts and political persecution with proof of official status. According to Albanian legislation, admission to Apollonia has been 300 lek per visitor and 150 for students, as well as the other admissions listed above. At times the ticket has included 3 guided tours per day, and overall mediocre visiting conditions. Speaking on the recent re-opening of the site’s Museum after 20 years, the UN Resident Coordinator in Albania, Zineb Touimi-Benjelloun, said: “I can only imagine the incompleteness of the cultural, historical, archaeological and touristic package offered by Apollonia as a result of the museum’s closure during this period”. Since the opening of the Museum, the local municipality has asked for an additional 200 lek per visit for themselves, bringing the total ticket price to 500 lek, while consultants have proposed a separate ticket for the museum as well as for parking. Included in the ticket price, is a mapguide prepared by The Millennium Development Goals Fund (Govt. of Albania programme, implemented by UN, funded by Govt. Of Spain) and is available in English, French and Albanian. Restoration of both the Monastery and Museum began in 2010 and the project was valued at 1,210,919 euros, with funding also coming over the years from UNDP and UNESCO, etc. Originally opened in 1958, the museum was reorganized in 1961 and again in 1985, until closing in the early 90s. The most important moveable objects were transferred to Tirana (under inadequate storing conditions). While it is unclear what is the true price of admission, we know that the law states 1000 lek for family care footage, which would include wedding photos. According to a local bar owner“We definitely get more couples (taking wedding pictures at Apollonia) than tourists during this month (August)”. There were 35,000 visitors to the park in 2006. Butrint is without a doubt the ‘wealthiest’ of the heritage sites in Albania, with money coming over the last 10 years from the Albanian American Development Fund, the Butrint Foundation providing 250,000 euros in 2005, ICOMOS, the Central Government, the World Bank who recently loaned US$1.68 million for biodiversity conservation at the site, World Heritage Funds, the Packard Humanities Institute, EU Funds, UNESCO Funds, and projects funded by Notre Dame University, the American Philosophical Society, etc. and ticket revenue from 82,000 tourists in 2011 (80,532 in 2012). It offers by far the most complete and visitor experience in the country. Recently opened in Butrint is a new electronic ticketing system, funded by Albanian American Development Fund. Ways in which electronic ticketing can increase ticket revenue are through reduced ticket-office resources and increased sales due to each visitor being quickly and accurately accounted for. The AADF is also overseeing the development of an integrated management strategy for 2013-2020, which includes managing the ticket revenue and other profitable activities over the next 7 years. Prior to this, a temporary ticket office was installed in 2001, and a more permanent wooden ticket office was completed in 2007. The majority of funds for Butrint come from foreign foundations, as well as from foreign tourists. Total income from all contributions to the site is now close to 1,000,000 euros a year. Ticket prices are 200lek for Albanians and 700 lek for foreigners. At an average of 400 lek per visitor, that’s 32,800,000 lek from tickets last year. According to a new law lobbied for with the help of the AADF, 90% of future ticket revenue will remain at the park. 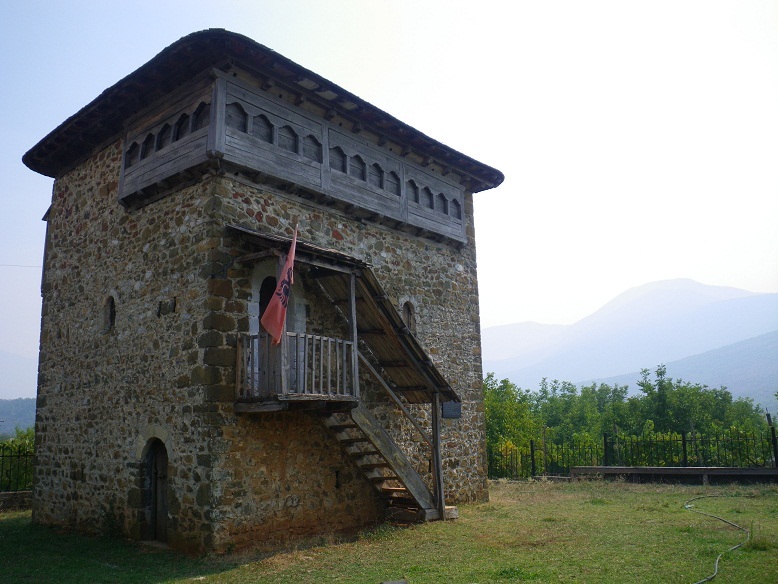 In the village of Bujan, Tropoje, relatives of League of Prizren hero Mic Sokoli are privately managing a free museum in the three-storey kulla where he lived. The last funds given to the museum house were by the Albanian Institute of Monuments for restorations in 1979 and it is still filled with Socialist Era displays and maps. Those funds came after the inauguration as a museum in 1978, 100 years after the League of Prizren. Since then, they have not received any funding whatsoever, do not even have a donation box, and the entire operation is done out of good-will and respect for the past. No payment, no tickets. There is a guest book, which along with their own personal estimations is the only statistical measure of visitors – which isn’t many. 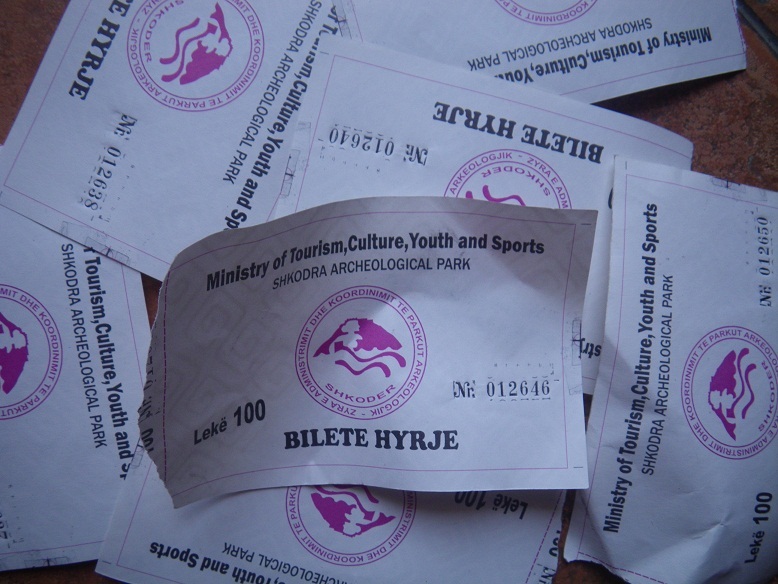 These are just a few examples of what kind of attention has been given to ticket distribution and income collection at Albania’s heritage sites. The result of years of this careless practice has not only made way for incomplete or inaccurate statistics, but also the loss of unknown amounts of lek along the way – lek that should be going to the care of the sites. These combine to mislead policy makers, administrators, donors, and the public as to the use and preservation of the sites, and it facilitates the spilling of funds into greedy pockets along the way. The truth is there is no way possible that Mr. Bumci’s precise number of visitors is accurate, given the current practice of ticket distribution in all but one site in Albania. How far have we come since 1913? You tell us! Next National History Museum Mosaic…What restorations?!! 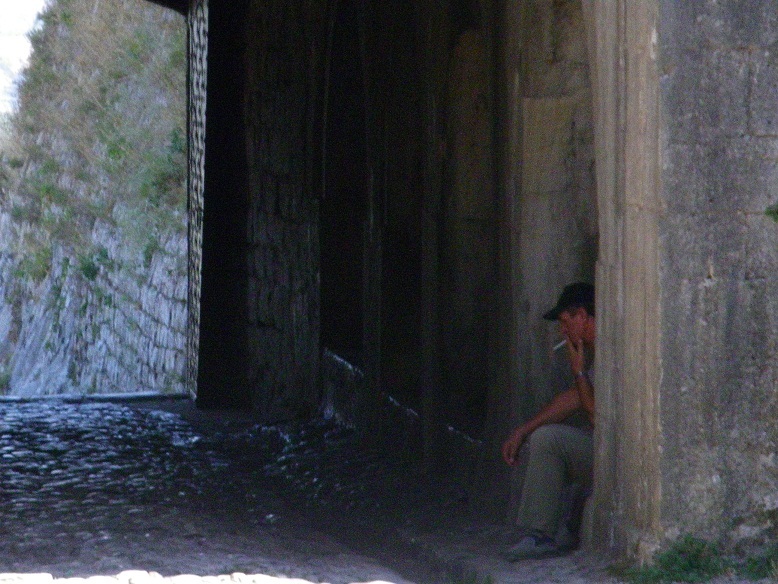 you figures about butrint are not correct. Thanks for your comment! The stats are definitely incomplete, we are always looking for more consistent and accurate numbers relating to arts and heritage, but they are often unavailable or conflicting. Can you share which figures you are referring to, and we can make note of it. Cheers!